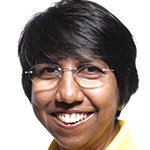 Ms K. Thanaletchimi is a Nominated Member of Parliament, and elected member of the NTUC Central Committee and the President of the Healthcare Services Employees Union (HSEU). She was elected as the President of the National University Hospital Employees’ Union (NUHEU) IN 1998. Ms K. Thanaletchimi’s passion is to advance the interest of working people on issues that matter most: jobs and cost of living, with a special interest and emphasis on areas related to women and healthcare. With more than 20 years of union work experience, she has insights into the issues that trouble ordinary working people – employment rights, workers’ dignity, and having adequate opportunities to enhance one’s skillsets to remain relevant in this changing economy. Being a full-time employee herself, she understands the challenges faced by women in the workplace as they go through different life-stages. It is her hope that over time, the labour participation rate for women will improve significantly to match that of Scandinavian countries. Ms K. Thanaletchimi continues to leverage her regular engagement with the working people to shape policies that affect working people, for the good of the nation and its future.